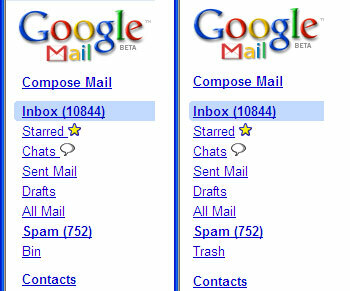 I have noticed that my gmail account now displatys "Bin" as the link for my deleted items rather than "Trash". I discovered that I could change it back by changing my "Google Mail display language" from "English (UK)" to "English (US)". It was apparent that Google had decided to respect my cultural differences and describe my deleted item container as a "Dustbin" rather than the americanized "Trash Can". So why did Google make this change? I had assumed that they wanted to personalise the UK experience by replacing those pesky americanisms and make my feel a bit more cosy about using a google produce that cared about letting me know that they undertsand that us brits have different needs that our colonial cousins. However, I really don't care if I call my deleted items "Trash" or "Bin", although if I was given the choice I think that "Dustbin" would be more appropriate. I thought that I would look at some other americanised google mail terms and see if these had been changed as well. On my gmail settings page I looked to see if the horrible "vacation" related options had been changed to the much more english "holiday". I was disappointed to see that I still had to experience the horrible vacation label. Google, if you want to patronise me by renaming my "Trash"can as a Dust"bin" then please be consistent and change the other examples of US/UK alternatived. Or why not save us all a lot ob trouble and change the label to "Deleted" and change the "Vacation responder" to the "Gone Fishing" option instead. While half-hearted (possibly quarter hearted in fact), the intention does bring a smile to my face. While Google has not in any way been consistant, it's good to see you acknowledge the fact that they tried. I can't think of many other big companies who would make even a quarter hearted gesture. Sadly, I think inevitably all British kids will in 2 generations be adopting the terms used by Americans. It seems not enough people care and that they see it as the evolution of the language. You notice that! Im kinda confused in many times, Me my self, i dont notice that. And it seems not a problem to me. The biggest problem is that when you want to search for emails in your "Bin", you still have to type "in:trash" as "in:bin" does not work. I've asked them on numerous occasions to change "Bin" back to "Trash" or make the "in:bin" search modifier work, but to no avail. Interesting post. I agree with you on the consistency part. Indeed if Google wants to offer a personalized UK experience, they can't sit back by merely changing "Trash" to "Bin". Hey, I thought it was great that they made the change. They could make another change. I wouldn't get histrionic about it though. bloody awesome. i can't stand bloody 'trash cans'. its about time someone got it right. Sounds like you're actually seeing "new Gmail" when you set to English (US); and seeing the "old version" when set to UK. Great eye! But you have a point...if Google are going to change things up like that, then they need to be consistent. By the way, you have a really great blog here. I'll be back!